Kindly read all parts and drop your views…..Thanks a lot for reading…. A disheartened gauri started thinking what she could do to sort out things…..But before that all her focus was to find Omkara as he was been missing from room for hours….Gauri rushed towards the reception and enquired the same……She got an invalid answer and hence she decided to go in search for Omkara…..
Gauri starts walking and running through streets screaming ..”.Omkaraji ” only…..Her eyes noticed a person’s image from back and gauri understood it was Omkara…..At a rush to reach him her leg slips , but soon a hand hold her and she got saved…..
Omkara : Gauri, you are here ?? Gauri : Why you left me alone ?? Om released gauri from his hold and turned his face from her eyes…. Gauri : Omkaraji, have you started hating me ?? Gauri : Then why you left me like that way ? Whatever feelings you have, this is not the way to deal with them..
Gauri : I can’t stay alone whole night at that room without my husband…..It’s really painful ……. Omkara : I think we should stop saying about that, right ? Gauri : Yeah [gauri nods her head] We need to find solution…..
Omkara :It’s not easy, gauri….You have seen how professor got disappointed with me……He is not ready to listen me ..
Gauri : I know, Omkaraji……But I think we should try once more……..
Gauri : What ?? But Omkaraji, what we will tell our family ?? Gauri : If we start running from failures, then we will never get a chance to win Omkaraji……. Omkara : Pls gauri, try to understand……My hands are trembling now, I am not able to touch brush as colors are mocking me, the empty canvas is showing that everything is finished and whenever I finds nature, soil, sky, stars……I can’t find any muse in them, everything has become so dark……And when I look to your eyes, it hurts me more that I have again given pain to you and I am not able to keep the promise, At this guilt I am getting burned per minute……..What will I answer to my brothers who said me to treat you like queen throughout this chance? Shivaay says you as his choti behan and I promised him that now I will never make his behan to cry….But I have broken all promises and finally my heart is also breaking……..
Gauri : Pls Omkaraji, Be calm……Nothing has broken and trust me I am not hurt…. Gauri : Okay, I admit that I felt pain, but you know what if my husband will fail without trying any more that will literally hurt me to the core…… Last but not least, just we need to make a try , pls Omkaraji for me you need to meet professor…… We will meet him together and will try to convince him…..
Omkara : And again If he says to leave , then…. 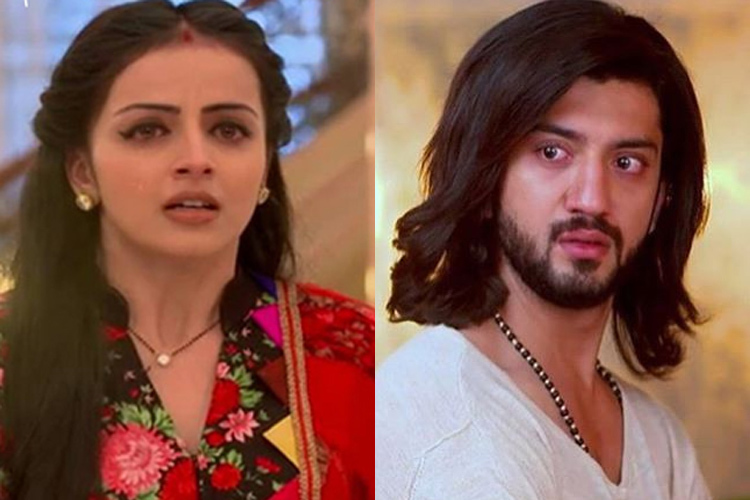 Gauri : Then we will leave this city by tomorrow itself…….It’s my promise…..Pls come with me…..
Gauri : You must take this, don’t refuse it…Omkara..
Om smiles…Rikara feed each other….. “Saathiya” instrumental plays…. Gauri brings Om near his canvas and looks at him…. Om closes his eyes for a while and quickly opened his eyes…..
Gauri : Did you find anything ? Omkara : You think so ? Gauri : I believe so, pls do it, Omkaraji…..Pls…. Omkara started painting on canvas and gauri starts praying her sankarji for making everything as good ….As soon as painting was finished, Omkara took it from the canvas and folded it..
Omkara : Shall we leave ? Professor : Why both of you reached over night , when I said everything is finished ? Gauri : Guruji, I am sorry for speaking like that…….Before coming to any conclusion will you pls take a look on this painting ? Professor : What you wants to prove now ? Your husband makes master piece and his master is not right ,won’t you ? Omkara : Sir, this is my last painting…….I swear if you will reject this then I will leave the world of art forever……Gauri my bags…..
Omkara : And if this rejection is a curse then trust me, your disciple Omkara will never touch any of these things which is been surrendered at your feet………I was leaving already, but my wife said without fighting if one is accepting failure, then he will never get a chance to win…….Her words enriched the courage in me to portray this painting over a mid-night …..I don’t know whether this small painting is upto your expectation, whatever I had poured here…….. it’s the reflection which I saw in my heart……..Now the decision is upto you…… Whether this disciple has failed or whether he will get a chance to win ?? Professor : Once you were my pride and I always felt no one can replace you , but whatever you done today……Any ways reconsidering you and your work If i find it is not worthy, then….. Professor : That means Omkara will no more remain as Artist Omkara if I denied this painting……. Professor : Let me see….. Professor goes inside with the painting……After some time he comes with two boys and stares Rikara…. Professor : Omkara and Gauri, so are you ready ? Professor : Meet these guys, Paul and Danny….. They greets rikara ……Rikara gets confused….. Professor : So Omkara, Paul is an expert in Epigraphy and Danny is specialized in Mural paintings…….Both know basics but they are not able to break the nut shell…..
Paul : Sir is talking about abstract sculpture art…..We are shrinked ourselves to our field of specialization…..
Danny : We are not complete, but Om you are complete…. Omkara : Not at all…..An artist can never become a complete artist, everytime he finds some thing new, he discovers things , he explores world and every day shades will get change and he need to find the rarest things also…..
Omkara : Sir…That means you have forgiven me……..Gauri, see sir has forgiven me…… I am able to learn abstract art now…..
Gauri : Haan Omkaraji…….You have won…..
Omkara : I realized it because your presence is filled in all these things and I am not able to live with out you…….gauri……..
Gauri ; I am also not able to live without you, Omkaraji……. Bgm….. “Heere moti mein naa chahun, mein toh chahun sangam tera……Saiyaan….Saiyaan…. Tujhe aise mein niharun, teri aarti utaroon, mein ban jawun ek jogan …….Saiyaan…saiyaan…” plays…..
AN : NEXT WILL BE THE LAST PART OF LOVE ME AS MUCH AS YOU CAN……THANKS FOR ALL YOUR LOVE AND SORRY THIS OS BECAME SO LONG ……. Amazingly awesome update akka..loved the way how gauri made omkie to agree for trying on last time..that’s a great one..will be waiting for the next..till then take care..and happy Makar Sankranti advance main hi bol rhi hoon..